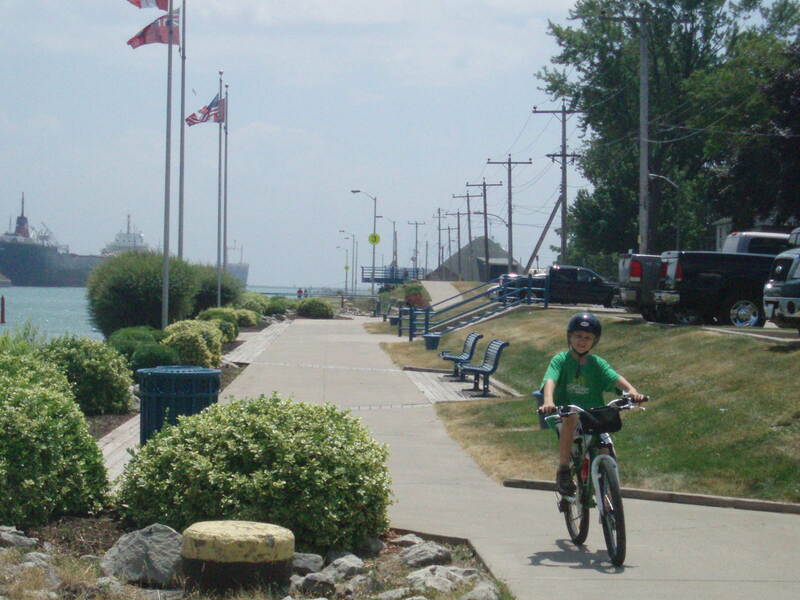 Port Colborne, Niagara – July 2011 // Wow… that was easy. 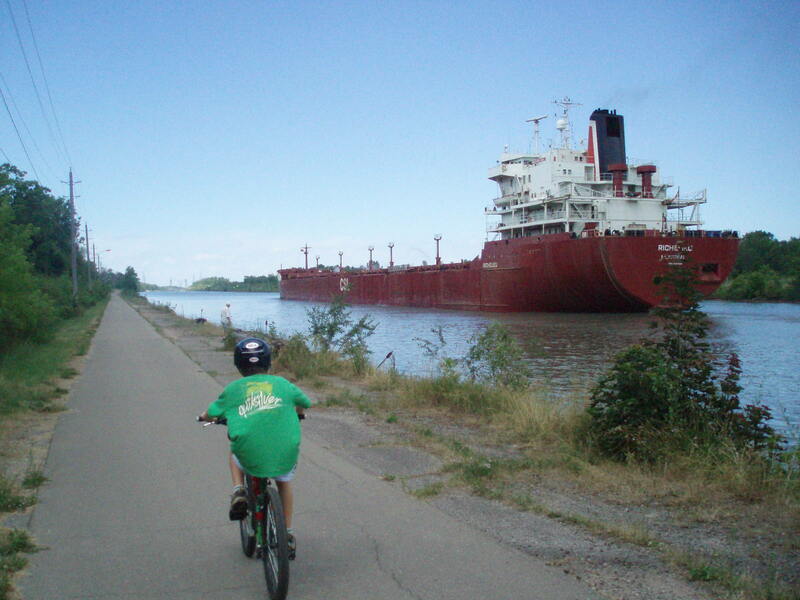 I didn’t expect that, on a bikes and transit daytrip along the Welland Canal with my nine year old. 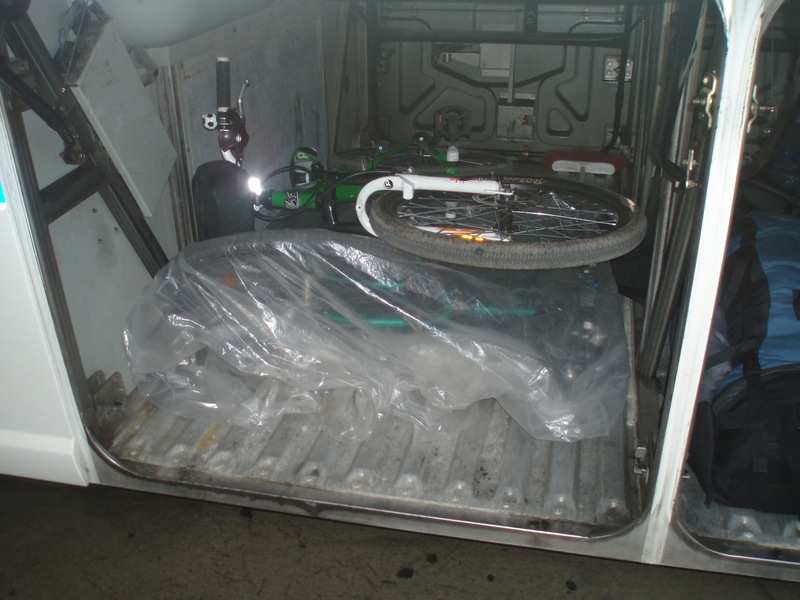 This route – the sixteenth to be added to BikesandTransit.com – is by highway coach, where you put your bike in a bag and under the bus. The big vehicles are so long, you can’t legally attach bikeracks up front, but there’s plenty of space underneath for plenty of bikes. Just watch your head as you slide your bike on in. The only stressful part of the day was the 8:15 morning rush hour ride from home to the bus station. We couldn’t take the subway – because bikes are banned during rush hour – but the new Wellesley Street east/west bikelane is actually quite safe. With kids on bikes in tow, Toronto drivers are also uncharacteristically courteous, but it’s still all quite nervy for a parent – especially when the big trucks and their big open wheels pass by. My son seemed oblivious to all the stress around him. When we got to Bay St. he rode his bike slowly south on the sidewalk. Arriving in plenty of time for the 9:30 bus, I was really looking forward to the canal bike trails, far from Toronto’s downtown maddening crowd. I have done this before by myself – jumping with my bike on the Coach Canada bus to Grimsby (to ride the escarpment west to Hamilton), so I know what to expect. Get your tickets at the regular ticket counter – bikes ride for free – and $10 bikebags are bought at the northwest end of the building, upstairs. You only need buy a bag once, they’re quite durable. 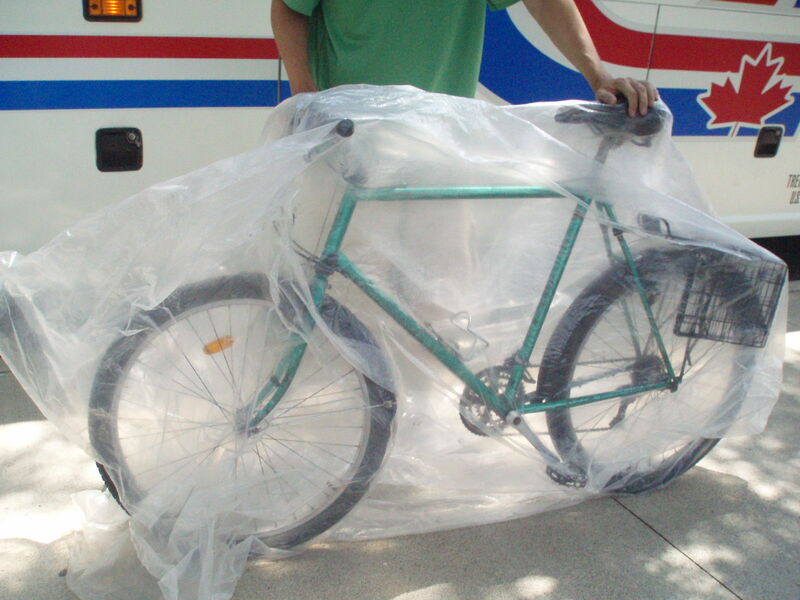 An older man traveling with his bike for the first time arrived at the last minute and was told to hurry and buy a bag. On the way home the driver told me I didn’t really need a bag. Best bring one along every time – keeps the dust off your bike anyway. Hardly minutes after our five kilometre bike ride to the bus station, and we were flying through Oakville, Burlington and past Hamilton on our way to Niagara. 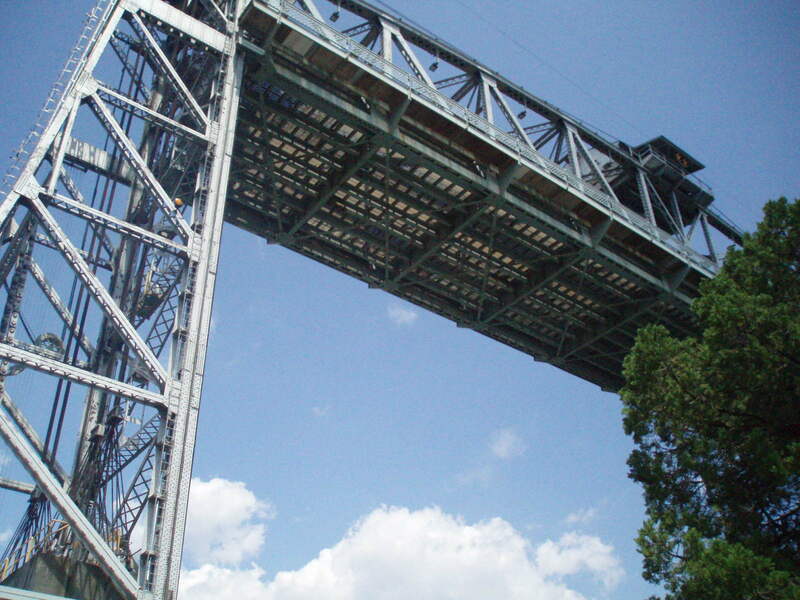 The bus does not go straight to Port Colborne unfortunately – so get ready for a relaxing, air conditioned tour of St. Catharines, Niagara Falls and Welland along the way! If you want to get off the bus and start cycling from St. Catharines, note there’s no return bus in the evening from Port Colborne. Also, be sure to keep an eye out the bus window as you exit the highway and enter St. Catharines – you’ll see the bike paths below that you’ll be returning on later that day. 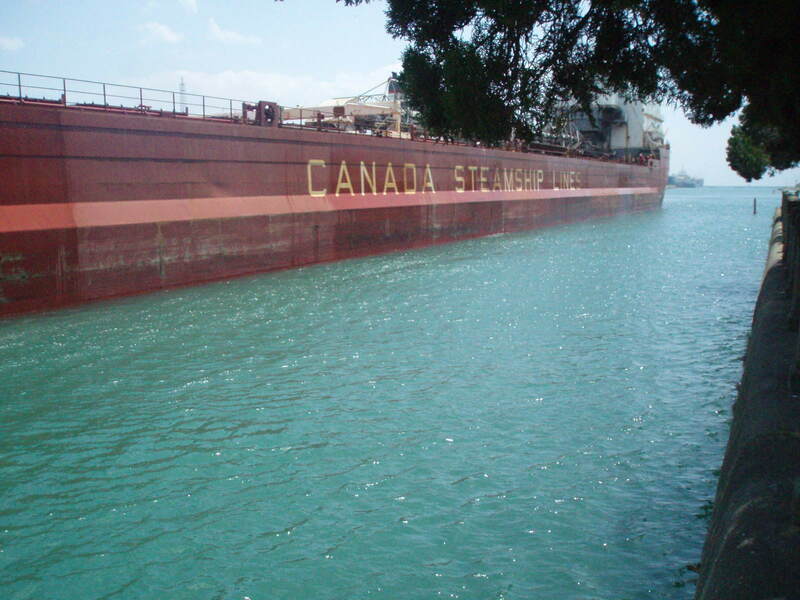 Landing in Port Colborne, you can’t miss that lakeside town feel, tourists everywhere, and huge ships back-dropping every view. We had a quick pizza lunch right near the bus stop. 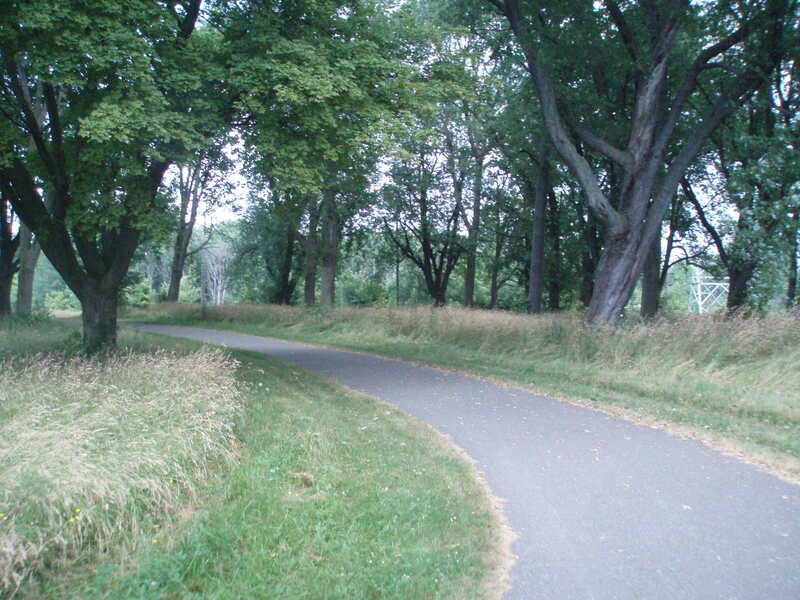 Then a quick pedal right, then left to the lakeshore, and there we were (ready to rock) at the southern tip of the Welland Canal Trail. A raised bridge for a passing Laker put a stop to our progress right then and there, but what a spectacle – and what a way to start the ride – as the big ship and waving crew passed just feet from us. Looks like the ships travel at 15 k/hr along the canal, because all afternoon we’d be catching up to them, and passing ‘em with ease! Even though the route is well signed, it’s best you have a Niagara Region Bicycle Map with you. Just after you begin riding in Port Colborne, there’s a bike shop with maps, Pedal Bicycles, where the canal meets Main St. West. 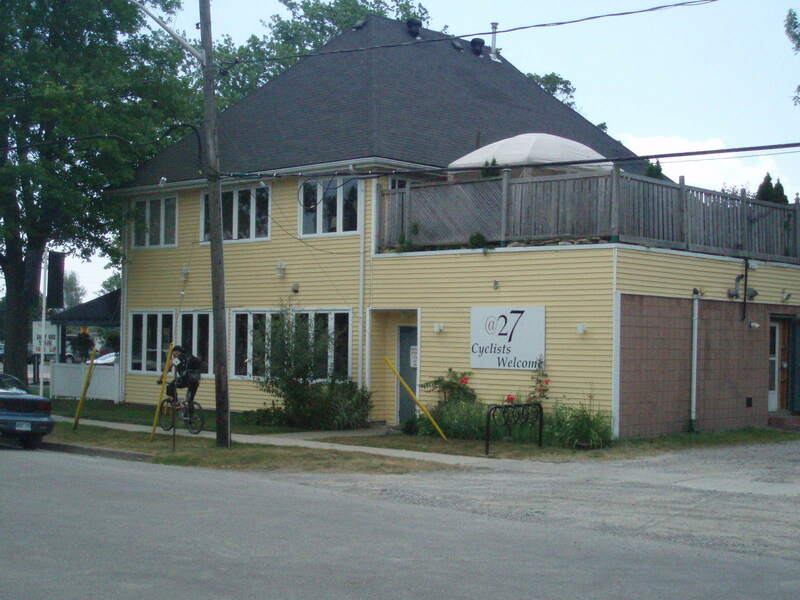 Also, near the end of the ride, at the Lock #7 Viewing Centre in Thorold, they have maps for $2. You really need the map, or printouts of the map, to find your way from the canal in Thorold to the bus home at the St. Catharines bus terminal! Map Packets are also available from BikesandTransit.com. 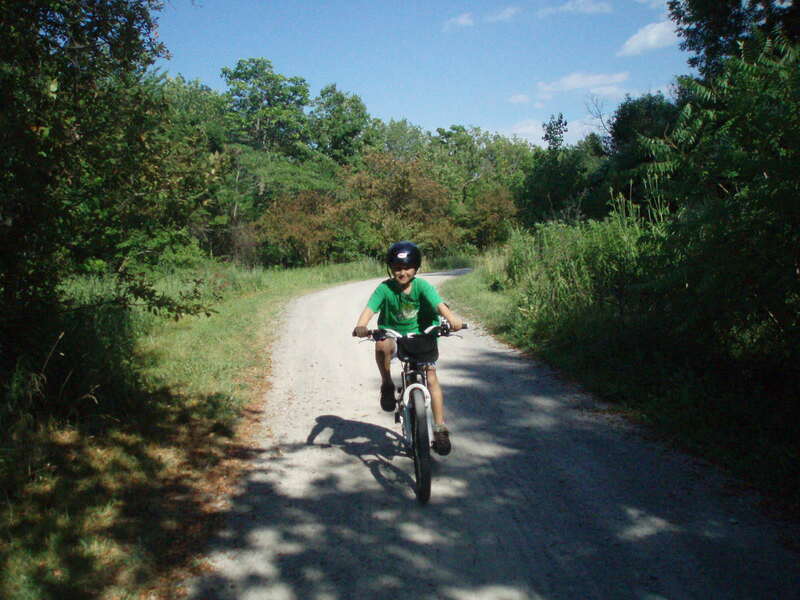 Overall, the 40 kilometre Welland Canal bike ride is truly amazing – and totally appropriate and easy for young children. Take your time, stopping every 10 kilometres or so, and they’ll be just fine. I have done daytrips with my kids between 12k and 50k and they’ve enjoyed them immensely, and have never had trouble doing the kilometres. 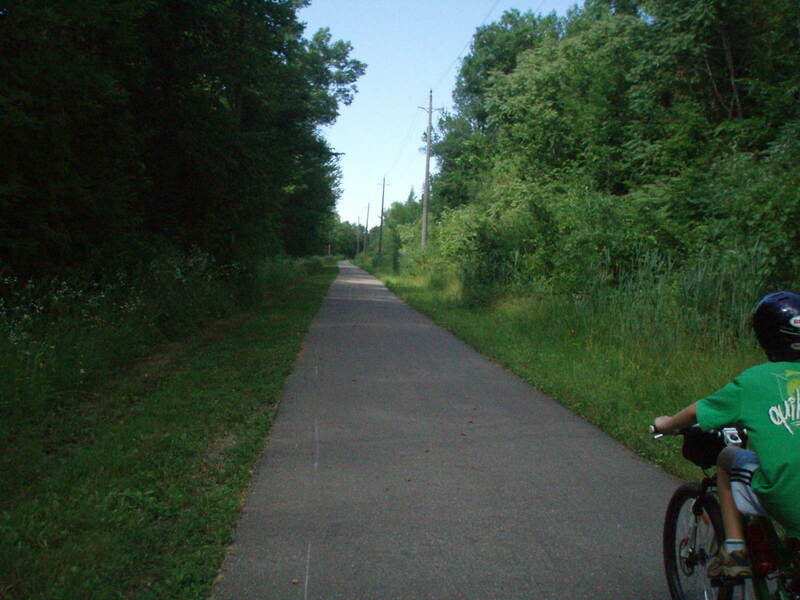 The benefit of the lakeshore, creekside and canal bike rides on BikesandTransit.com is that they’re predominantly flat routes. So with all their energy, kids can just pedal away at their own speed, and put down some surprisingly long distances. The transit rides there and back are great fun for them too! 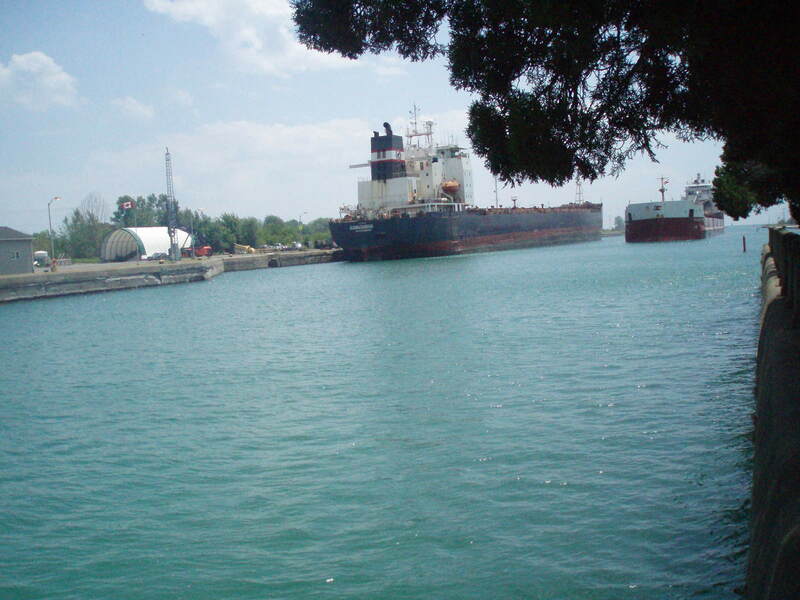 Kids or no kids, The Welland Canal is definitely one of the most memorable bike rides around. The Coach Canada connections on either end make it convenient – and easy to leave the car at home. The big ships, bridges, train tracks, paths, canals, canals, and more canals… are truly mesmerizing. Bring a picnic, and a camera, and take the whole day. If you have the energy, and the time, at Lock #7 in Thorold, ride a little further north to view the locks, and just how significant the drop from Lake Erie to Lake Ontario really is. Remember though, the further downhill you ride, the steeper back up the hill to the trail west to the bus station. The first time, you never really know where the bus station is in St. Catharines, so it’s best to get there with lots of time to spare. An hour is plenty of time to get from the canal to the bus terminal, and get lost a few times along the way. Be sure to have a copy of the Niagara Region Bicycle Map, and ‘Zoom In’ on the Welland Canal Map on BikesandTransit.com to study the end of route. Check what time the sun sets too. The bus drops you in Port Colborne at 12:15, and there’re buses home to Toronto in St. Catharines at 6:15, 8:30 and 9:30 (and just in case 10:45). Plenty of time to get there before darkness falls. 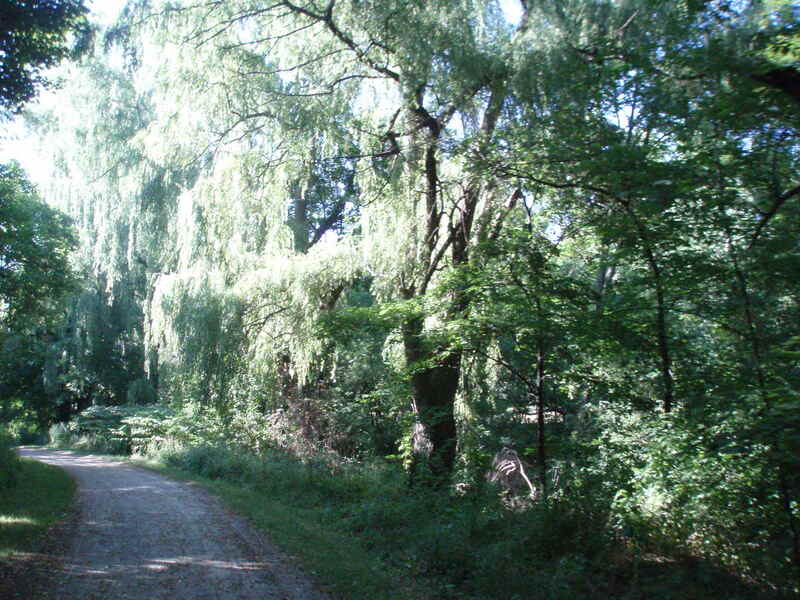 On the summer weekday that we were there, the Trail was practically deserted. Even if you’re planning to go on a busy summer Saturday or Sunday, rest assured the path is nice and wide. We were (very) lucky on our trip, and had the wind at our backs all the way. My son seemed quite motivated by this, and by the presence of the big ships. There were also plenty of opportunities along the way to eat good food, and junk food alike! As usual, we brought along a lot of water and sunscreen so we wouldn’t suffer under the blaring sun. At the bus terminus in St. Catharines at the end of the day, we learned that the 6:15 was full and we’d have to wait for a 7:15 casino bus to pick us up. No problem – after such a great ride – but, if I’d been more alert, we could have had a nice supper nearby on a nice patio while we waited. With permanent smiles we instead just shuffled over to a corner store and bought a big bottle of water to drink while we waited. Back in Toronto at about 8:30, the five kilometre ride home from the bus station was a lot less hectic, and the downtown much, much quieter. 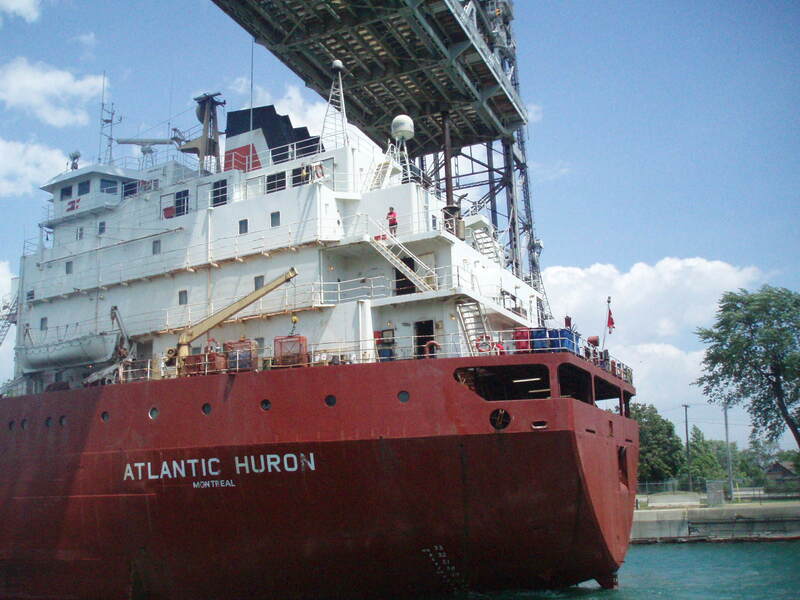 Home by 9:00, just thirteen hours after we’d left, and we were – after a day of first hand, up-close experience – now well aware of the awesomeness of The Welland Canal. And definitely… none the worse for wear! 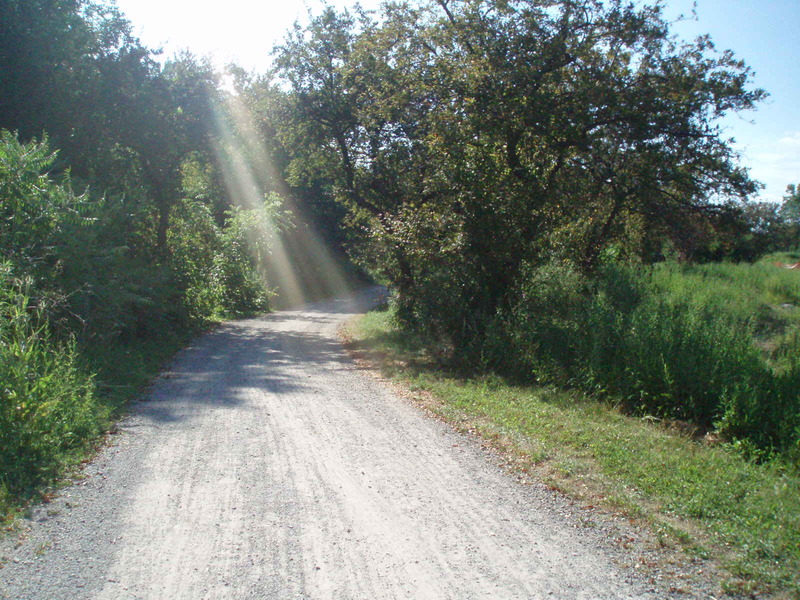 Photos: The Welland Canal Trail – with Coach Canada!